The death of Captain Phil Harris toward the end of the sixth season of Deadliest Catch resulted in some of the most riveting and emotionally wrenching episodes of any reality series in TV history. As the seventh season opens, it’s clear that Harris’ death still looms large over the series, a point driven home by the opening voice-over narration, seemingly delivered by the skipper from beyond the grave. The fisherman of Dutch Harbor give Captain Phil an appropriate sendoff, floating his ashes out to sea in a crab pot and toasting his memory against a backdrop of fireworks. It’s a rare moment of joyful camaraderie in the two-hour season premiere, “New Blood,” because it’s time to go back to work. And as longtime viewers of the series know, that usually means it’s time for tempers to flare. Despite several captains threatening to quit the show and a lawsuit filed against them by Discovery, all the regulars are back on board (save Captain Phil, of course, although he still appears in the opening credits). Keith Colburn, captain of the Wizard, has gotten a jump on the king crab fishing season, setting a course for a rugged area he’s never fished called “Black Hills.” Aboard the Time Bandit, Jonathan Hillstrand is betting his season on fishing the same grounds for the fourth year in a row, a decision that doesn’t sit well with his brother, Andy. Sig Hansen anticipates the fleet clustering in one area and plans to keep the Northwestern above them at all times. And then there’s the Cornelia Marie, now in the hands of Captain Phil’s sons, Jake and Josh. The brothers have hired Phil’s old friend Derrick Ray to captain the boat, thus depriving us of the comedic potential of Jake and Josh attempting to run the Cornelia Marie together. If the opening two hours are any indication, however, there should be no shortage of drama resulting from this new set-up. For one thing, Jake is fresh out of rehab, and the new skipper wants a urine test to make sure he’s clean. What follows is perhaps the most suspenseful piss in television history (“I just barely tinkled, man”), but when the results become clear, Jake has passed the test. He hangs the results card on the refrigerator with pride, leaving me with only one question: Is there pee on that thing? Jake may be clean, but that doesn’t mean that dealing with him will be a walk in the park for new skipper Derrick. It’s an interesting dynamic that should provide plenty of fireworks as the season progresses: Jake is a crewman, but he’s also co-owner of the Cornelia Marie. When Jake and mechanic Steve disappear for several hours to run errands in town while the rest of the crew is trying to get the boat ready for departure, Derrick is understandably frustrated with both of them but takes out the lion’s share of his wrath on Steve. It will be interesting to see how Derrick manages Jake as the season goes along—or if Jake can be managed at all, under the circumstances. The fact that two members of the crew nearly come to blows before the Cornelia Marie has even left port doesn’t bode well for a harmonious voyage. Perhaps covering their bases in case a deal had not been struck with the Hillstrands and Sig Hansen, Discovery has added two additional crews to the Deadliest Catch roster this season, representing the new guard: the Seabrooke, under the command of 36-year-old Scott “Junior" Campbell, and the Ramblin’ Rose, skippered by the fleet’s youngest captain, Elliott Neese. So far, the newbies are a study in contrasts, as the Seabrooke appears to be a well-oiled machine, striking gold with its first set of pots, while the young Ramblin’ Rose crew is raw and disorganized, at least at the outset. 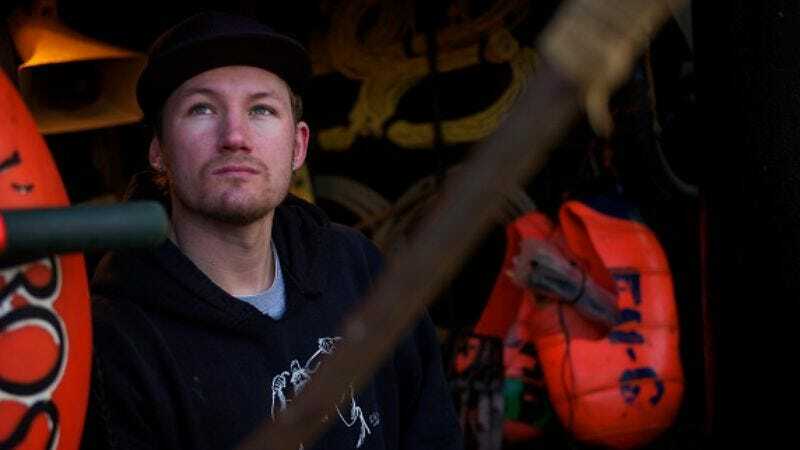 “New Blood” certainly doesn’t reinvent the captain's wheel (if that’s even possible seven seasons into a series), but it ably demonstrates why Deadliest Catch remains the gold standard for workplace reality shows. As the old Navy slogan goes, it’s not just a job; it’s an adventure. Most of us wouldn’t last a day on the Northwestern or the Time Bandit, but without ever leaving the couch, we get to experience the waves crashing onto the deck, the pots hurtling overboard, the crabs pouring into the hold, and the bleeped insults shouted from the wheelhouse, all in glorious high-definition. It’s true that many of the participants are seasoned reality TV veterans by this point, but even if some of the interpersonal drama is manufactured for the benefit of the cameras, the ongoing battle of man against the sea is as real—and compelling—as it gets. The biggest gambles made by the veteran crews did not pay off, at least in this episode. Both the Time Bandit and the Wizard came up empty with their test strings, and both are forced to look elsewhere for the elusive king crab. Judging from the party-dude rock guitar that accompanies the antics aboard the Ramblin’ Rose, we’re obviously meant to think of its crew as the wild men of Dutch Harbor. It’s a little hard to do that, however, when the craziest thing they do is bake a little cake for one guy’s 30th birthday. Slow down, dudes! It’s a long season! For the record, I did bite the head off a herring before writing this review.